A cinder block falls on Akard Drearstone’s head and leads to an alternate 1975 history of rock music as seen through the eyes of a twelve-year-old girl. 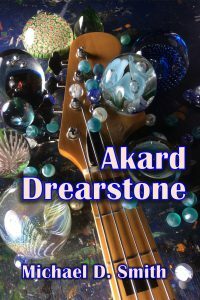 Jan Pace, a twelve-year-old girl at the Akard Drearstone commune north of Austin, Texas, watches Akard Drearstone and his fellow musicians setting up for what they think will be a small concert on their dirt parking lot. Jan, who knows she’s in love with the twenty-seven-year-old bass guitarist Jim Piston, tries to comfort him while he freaks on marijuana. Meanwhile, to everyone’s shock, thousands of Akard Drearstone Group fans have invaded the parking lot and the vast fields beyond. During a break, the musicians discover that Dallas businessmen have bought Freeway Accident Records along with the Drearstone Group’s manager, Harray Andreall, onetime member of the commune. Commune member Bill Dunn is invited to play guitar on “Overturned Runway,” but narcs raid the concert and kidnap him. At the Overturned Runway Bar, named in honor of their song, the musicians begin to realize how famous they’re becoming. Michelle Morgan, journalist and fiancée of Harray Andreall, explains the principles of her new philosophy, Exponentialism. Declaring bassist Piston to be the core genius of the group, Michelle interviews him for Worthless Weekend Sunday Magazine and seduces him during the interview. Harray and Michelle fight about Buddhism on their wedding night. En route to the reception at the commune, Harray plunges into metaphysical horror. To soothe him, Jan takes him to see her horse at the barn–but there they discover a dead body packed in ice. Though he tries to convince the sullen members of the group that their musical experiment is worth continuing, Harray’s boss has been arrested on murder charges, the record company is on the verge of collapse, and Harray is dumbfounded to discover a second killing perpetuated by a second band he manages.